Cook the savoy cabbage in boiling salted water for approx. 20 mins. Remove the cabbage, allow to cool slightly. Cut away the stalk with a paring knife. Fry the diced bacon and onion in a non-stick frying pan for approx. 3 mins. Add the mushrooms and cook for a further 5 mins. Transfer to a bowl, leave to cool. Add the mince, apple, thyme and mixed seeds, season, knead by hand to form a compact mass. 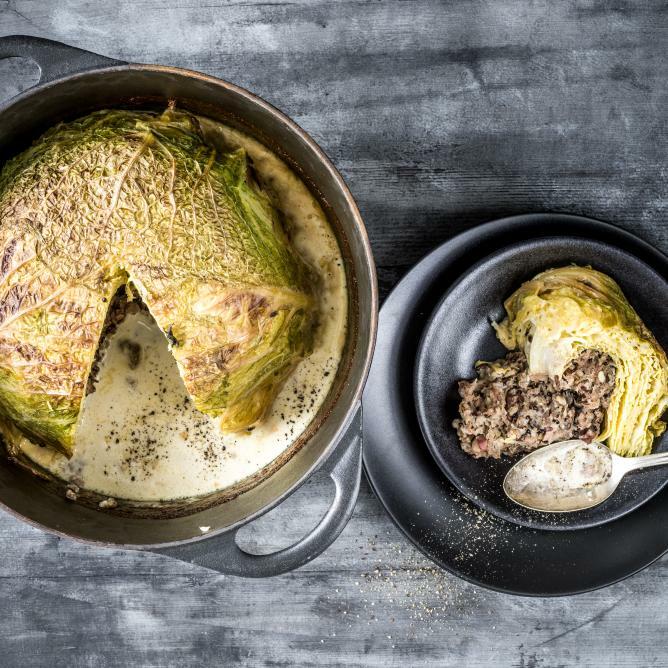 Stuff the savoy cabbage with the mince mixture. Pour the cream into the cooking pot, season. Place the cabbage in the pot, stuffing side down. Cover and cook for approx. 30 mins. in the lower half of an oven preheated to 180°C. Remove the lid and continue to cook for approx. 15 mins. Cook with the lid on for approx. 30 mins. in the lower half of an oven preheated to 180°C. Remove the lid and cook for a further 15 mins.